To book a Bed and Breakfast stay, review rates and availability and make a reservation online go to our reservation calendar; for Vacation Home rentals and the Shorecrest Beach house go to our Holiday Rentals reservation page. Once you have chosen your desired rental house property call Marilyn at 631 765 1570 to finalize your booking. 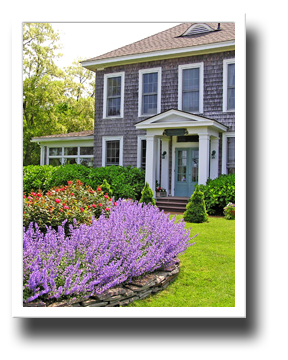 Shorecrest Bed and Breakfast not only offers the best BnB location and amenities on the North Fork of Long Island, but we also manage several vacation rental properties in the area that can accommodate families and in some of them, even your pets. Shorecrest Property Management and Real Estate has you covered whether you are visiting the East End of Long Island with your partner, a group of friends interested in exploring Long Island wine country and enjoying great local food, or a family vacation or re-union complete with kids and the family dog. To check availability, details and photographs visit our online reservation calendar. 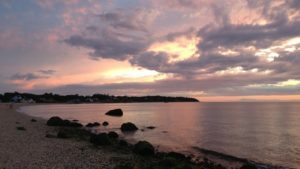 The Shorecrest Beach House sits atop a grassy bluff overlooking the Long Island Sound and is available to rent weekly, monthly or seasonally. It has just undergone a major renovation adding a large open plan room on the second floor which includes a seating area next to picture windows offering expansive views of the water and two twin beds. There are 3 bedrooms on the ground floor, one with a king bed, one queen, and the third with two twin beds. The kitchen and both full bathrooms on the ground floor have also each been fully renovated and guests love the panoramic views of the beach and sunsets viewed through the wall to floor to ceiling windows in the living room and from the deck. In the evening you can relax in front of the the open fireplace, and giant flat screen TV, or cook up a great dinner from local fare in the new fully equipped kitchen with dining area for six. Enjoy mornings and sunsets and al fresco dining on the deck. The kitchen is fully stocked with all you need for cooking and serving, and all linens are provided. Other amenities include, WiFi, centralized air conditioning and heating, a laundry room and beach chairs. Beach House renters can take advantage of the wide variety of activities found in the area, and exclusive to guests, our beach on the inlet to the rear of the BnB, great for paddle boarding and kayaking. Shorecrest Bed and Breakfast concierge services are also available to beach house guests and each renter will receive a winery discount card to 24 local wineries. For rates and prices click here. The Inn itself is a five bedroom home that can sleep ten visitors. 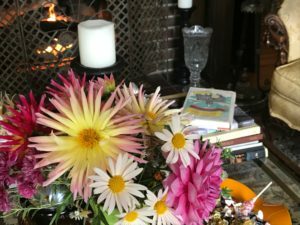 Although during the summer season, the BnB runs as a Bed and Breakfast, it is now available for private home rental for corporate events, group vacations, or family reunions complete with a housekeeper and cook. Visitors are free to utilize the library, screened porch, gardens, deck and living room. 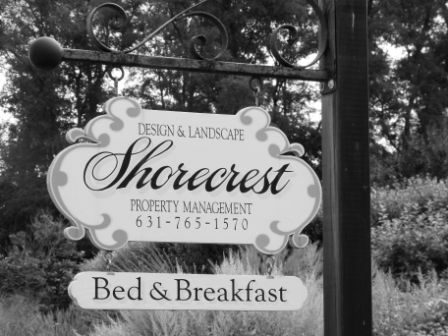 Take the time to view the Shorecrest Bed and Breakfast website for more information. Click on the check availability BnB tab for rates. Located in the village of Aquebogue the Peconic Bay Beach house is a new construction, spacious, three bedroom, three bath home. The ground floor is open plan with a roomy fully equipped kitchen, an adjoining dining area that seats 6 to 8 people and living area with fireplace. Visitors will enjoy floor to ceiling windows with French doors that open out on a covered porch and lower deck perfect for outdoor dining while overlooking the water. A few steps from the lower deck is the private community beach. For rates and prices click here. Enjoy luxurious lakefront living with only a short walk to a sandy beach on Shelter Bay. All three bedrooms are equipped with cable TVs with dvd. Hardwood flooring, lake views and Country French Decor surround visitors with decorative warmth and many fine amenities. They include two full bathrooms, (one on each floor) a sitting area with fireplace, Cable Vision Triple Play, double burner gas grill on the spacious deck overlooking the lake, and a fully equipped French Country style kitchen with all new appliances. Where the garden borders the lake the floating dock is the launching pad for kayaking, canoeing on the private East Marion Lake, and the a short walk down Trumans Path will take you to the community’s private Shelter Bay sandy beach with a private mooring for your boat if you need one. 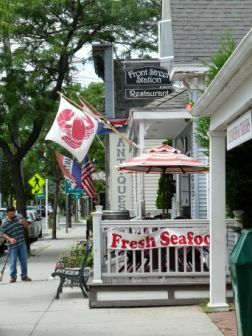 Five minutes drive from Greenport village and the ferries to Shelter Island, the Hamptons or Orient Point to Connecticut and New England, the East Marion Lake Front house is conveniently located for easy travel, shopping, antiquing, vineyards, bicycling, dining & all the entertainment and activities the North Fork offers visitors. For rates and prices click here. The Southold Bay Inlet House is located on a large landscaped property with private waterfront on the largest inlet on tht of Shelter Bay. Floor to ceiling windows from the west facing side of the house offer incredible views of sunsets and the bay. The three bedrooms all with queen beds are exquisitely appointed and include amenities such as a deck overlooking the inlet and Jacuzzi tub in the second floor master bathroom, French doors that open into the garden from the ground floor king bedroom, with private bath. The well stocked designer kitchen will see your family or group through the most lavish meals. A spacious living room with a fireplace and extra seating overlooks views of the lawn and stone patio. 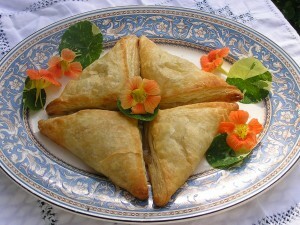 Feel free to make use of concierge services offered by the Shorecrest Bed and Breakfast. For more details and rates visit the Shorecrest Property rentals reservation calendar. 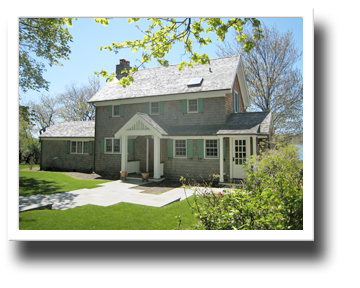 The Southold Inlet House has limited availability so book your rental now. 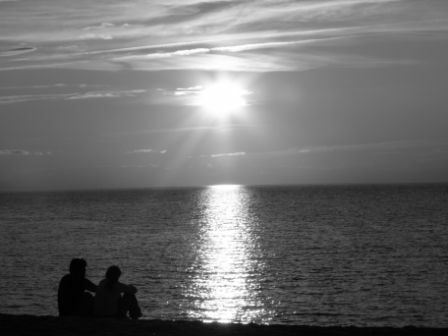 Whether you plan to celebrate a honeymoon, an anniversary, or a weekend with your business’s management team to celebrate a recent success, North Fork Long Island has plenty of entertainments and opportunities for Rest and Relaxation for you customize for your enjoyment. On the Shorecrest Bed and Breakfast website you will find a map on the Area Attractions page that lists, as well as shows you the location, of every kind of local amenity from restaurants to golf courses, marinas to churches. 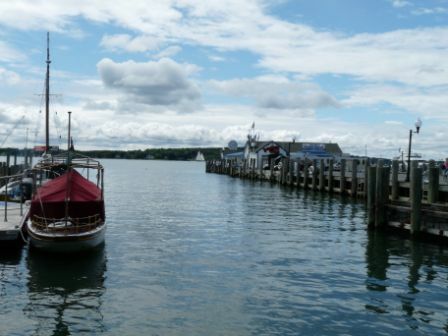 Combined with the event resource on our blog calendar you will be well set to plan your North Fork stay. Don’t forget to check out the Shorecrest Bed and Breakfast Blog Calendar to see events taking place now!